PHOTO MONTAGE BY HARALD KUNZE. Clockwise from upper left: duck legs in Málaga wine sauce with red Torques 2002; Harald Kunze, who took these photos; old posters; raspberry sorbet with dark chocolate truffles; piquillo peppers stuffed with bonito in tomato sauce; duck leg and sauce to mop up with bread; spring flowers; Julian Sanjuan introducing the wine and me, sniffing; two of the wines sampled; wine labels. In the center, duck liver pâté and aged sheep’s cheese from León. I recently participated in a Wine and Food Pairing event at the Museo del Vino, a museum and vinoteca in the village of Mijas on the Costa del Sol. Sponsored by the local Foreigners Department of the Mijas town hall, the tasting attracted residents who were British, American, Canadian, Scandanavian, German, Dutch and even a few Spanish. Featuring five wines and five (small) plates of food, the lunch-hour tasting cost €20 ($27). Thirty of us sat around four heavy wooden tables in the upper level of the Museum, decorated with ceramics, old posters and other wine paraphernalia. (Downstairs is a wine bar, tasting room, cellars, shop and charming patio.) Julian Sanjuan, proprietor and host, made the rounds to introduce each of the wines as they were poured. Julian, who originally trained in art history, got into the wine trade by the side door. His purpose was to convert historic buildings—a distillery in the village of Ojen, an electric switching station and village house in Mijas—to small museums, originally featuring the wines of Málaga. As both sites became popular tourist destinations, he gradually increased his knowledge and stock of wines from all the regions of Spain, taking courses in oenology and tasting at the University of Málaga and University of Barcelona. We started with a chilled white wine, Castaño 2008, from DO Yecla in the eastern province of Murcia. Yecla, once known mostly for producing bulk wines of little distinction, now makes some superb wines. Composed of half Macabeo, a rather blah variety, and half Chardonnay, the Castaño never spent time in oak, so kept its freshness, aromatic qualities and pleasing acidity. The wine was a good aperitif and a sprightly contrast with piquillo peppers stuffed with bonito and napped in tomato sauce. Next was pisto con atún, a medley of vegetables including zucchini, tomatoes and peppers. This version included chunks of potatoes and meaty tuna. We tasted Pagos de Araiz 2007 from DO Navarra (north of Spain, next to La Rioja). An estate-bottled wine made up of 60 percent Tempranillo, Spain’s main red-wine grape, and 20 percent each of Merlot and CabernetSauvignon, the Araiz had three months on oak. What followed was, for me, a whole new experience—a red wine from DO Málaga. Málaga, for centuries famous for its sweet muscatel wines, now produces table wines of some note. This was Torques 2002 from inland Antequera, a blend of half Syrah and half Merlot—neither of them Spanish varietals—with 12 months in new oak. At first taste, it seemed tannic, but as it opened, I could taste lovely flavors of fruit compote and spices. The Torques accompanied braised duck legs with a reduction of Málaga wine, PX and the duck juices with prunes. Funny how, after a few glasses of wine, the noise level goes up. Our group of tasters was now gabbing and talking back and forth, comparing notes. The wine that came next was a revelation for me—Señorio de Broches, a sweet white moscatel of DO Málaga, from the Bodegas Dimobe in Moclinejo. The grapes are sun-dried a week before pressing. The must is cold-fermented and fermentation stopped with the addition of grape alcohol in order to keep residual sugar. It was fresh, not too sweet, with hints of tropical fruit, apricots and orange blossom, truly delightful. The Señorio de Broches was paired with pâté of duck liver sprinkled with coarse, spiced salt and aged sheeps’ milk cheese from León. The final wine, a true dessert wine, was also a muscatel, also with DO Málaga, from Bodegas Málaga Virgen (also in Antequera). The mahogony-colored wine was syrupy, but with hints of bitterness. Julian explained that the grapes are “raisinized”—dried in the sun for 20 days before vinification. Grape alcohol is added to stop off the fermentation, maintaining the natural sugars. The wine is then aged 10 months in French oak, smoothing the flavors and giving them balance. It was served with a spoonful of tart raspberry sorbet and a dark chocolate truffle. The chocolate seemed to turn the wine into caramel sauce. Yum. Recipes for some of the dishes served at this tasting meal have appeared, in somewhat different versions, in previous blogs. Vegetable medley (pisto) is here; stuffed piquillo peppers is here. My version of the sauce for duck is below. This sauce is similar to the one served with the duck legs at the wine-tasting lunch. If desired, use prunes instead of dried figs. Serve this sauce with foie gras, grilled duck breast or braised duck legs, pork tenderloin or with any dish where the sweetness of the fruit makes a good contrast. Pedro Ximénez wine (also called PX) is a superb choice, but Muscatel or oloroso Sherry could be used instead. If desired, add a splash of Sherry vinegar to the sauce for a sweet and sour effect. Cut out the stems and rinse the figs in running water. Chop them coarsely. Heat the oil in a small frying pan and sauté the shallots for 3 minutes. Add the orange zest, figs, wine, water, salt, pepper and cloves. Bring to a boil, then cover and simmer until figs are softened, 15 minutes. Serve the sauce hot or room temperature. My artichoke plantation has been through several incarnations. First, I imagined the stately, perennial plants on the rough slope above my terrace. I harvested a few, but the plants did not thrive, for the soil was too poor. Next I tried two separate locations in “loamy” garden soil (loamy, in quotes, because in southern Spain, except in river bottoms, loam does not exist). The ants devastated the plants, tunneling beneath them, turning them into aphid farms. Once artichokes, a cultivated thistle, seemed the most exotic of vegetables, but, for me, they have become familiar and desired. When my kids were little, I would buy artichokes by the crate at the wholesale market and experiment with every possible way to prepare them. Kids, by the way, adore artichokes. I think it’s the entertainment value of plucking off leaves, dipping in sauce, pulling them through the teeth, piling up the debris. Or maybe it was just the mayonnaise—my kids would eat anything served with (homemade) mayonnaise. After watching Spanish home cooks prepare artichokes, I’ve thrown out a lot of received culinary wisdom about this vegetable. First and foremost—forget rubbing them with lemon or dropping the trimmed artichokes in acidulated water. Lemon changes their natural sweetness and turns them an unnatural color. Without lemon, artichokes will darken slightly, but it’s a natural, dark green. 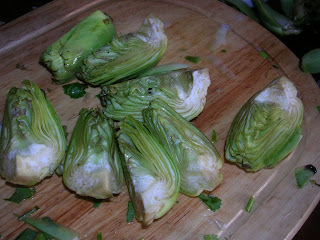 The only trick, really, is to have the water boiling or the oil heated and to cook the artichokes immediately. Another suggestion: trim minimally, but be willing to eat them “hands on.” My favorite everyday way with artichokes has always been to cook them whole in boiling salted water (having cut off the stem and snapped off only a few outer leaves). They are done when a leaf pulls off easily. After draining upside-down, I open up the leaves into a wide rosette (usually one artichoke per person) and use a small spoon or melon baller to scoop out the fuzzy choke. This leaves a nice well to be filled with olive oil, vinaigrette or mayonnaise. You pull off the leaves, one by one, and dip them into the vinaigrette, then pull the leaf through your teeth, extracting the tasty pulp. Discard the fibrous leaf. When you get down to the heart, also called the bottom, use a knife and fork to cut it into bite-sized bits. 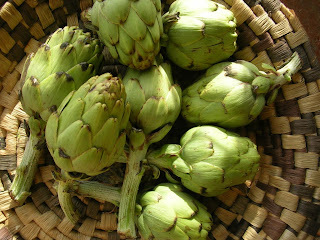 Another easy way to prepare artichokes is to cut whole ones into quarters (or, if large, into sixths). Use the tip of a knife to nip out the choke and immediately add the artichokes to the pan. To eat them, pick up the pieces by the leaf tips and bite off the whole fleshy bottom, then discard the tips. In paella making, quartered artichokes are added to a sofrito before the addition of rice and stock. I used to parboil them, thinking to stabilize the color, but I noticed that Spanish cooks don’t bother. Artichokes add a very special flavor to paella rice. Again, you have to expect to pick up the artichokes with fingers—but then, in home style paella, diners might need to shell the shrimp too. Should you prefer no-mess, fork-ready artichoke hearts, then, yes, get ready for some trimming. Cut a slice off the artichoke bottom, discarding the stem. Remove about three layers of outer leaves. Use a serrated knife to cut off the top two-thirds of the leaves and discard them. Now you have a round artichoke bottom. With a knife tip, pare around the base, smoothing it out. Scoop out the fuzzy choke inside. You should, in theory, have a fleshy artichoke bottom that is totally edible. 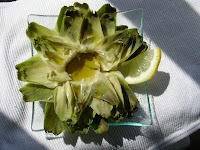 Cook it immediately or drop into acidulated water as you prepare the rest of the artichokes. 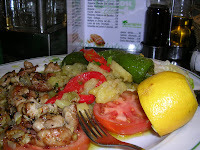 This is a favorite dish in the tabernas of Córdoba. The artichokes are first sautéed, then simmered in Córdoba wine, the dry fino of Montilla-Moriles, which is similar to Sherry fino. Supposedly artichokes don’t pair well with wine, but fino, whether from Montilla-Moriles or Jerez, makes a perfect match. 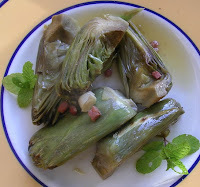 Artichokes prepared in this manner make a good starter. Makes 8 tapas or starters. Crush the saffron in a mortar and add the hot water. Allow to steep. Heat the oil in a cazuela (earthenware casserole) or skillet. Add the artichokes, garlic, onion and ham and sauté 5 minutes. Stir in the saffron water, fino Montilla, water, salt, pepper and sprig of mint. Cover and cook until artichokes are tender, 15 minutes. Add additional water, if needed. Serve hot or room temperature sprinkled with chopped fresh mint. I go into the village three mornings a week to work out at the local gym. I’m not becoming musclebound, by any stretch, just desperately trying to keep toned. Afterwards, I head for a café in the plaza for a café con leche, strong espresso coffee with milk. The café is sort of like my living room—I sit by the window, read the local (Málaga) newspaper and keep an eye on comings and goings. Then I check the mail at the post office and stop at the market for fresh fruit and veg, meat, eggs, fish. The other day, a recipe in the newspaper for a mussel gratin with spinach caught my eye. I’ve got lots of spinach in the garden, so that became my dinner plan. No pumping iron to get this kind of mussel! I bought the mussels at the market and headed home. But, then it started pouring rain—and never let up all day. I couldn’t go pick the spinach without getting drenched, so I looked for another mussel recipe in one of my cookbooks, MY KITCHEN IN SPAIN (yes, that’s the title of the cookbook as well as the blog), and came up with a Galician mussel and potato stew. 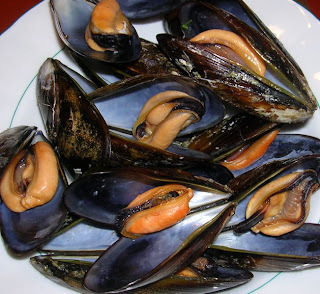 Most mussels come from Galicia in northwest Spain, where they are “farmed” on flats anchored in the Atlantic surf. They are plump and meaty, but do require considerable scraping and cleaning. Next time, I think I’ll add chopped spinach to the potatoes as well. It won’t be traditional Galician style, but I think very good. Pimentón is Spanish sweet paprika. In this case, it is not smoked paprika. If you like, add a pinch of red pepper flakes or cayenne as well. 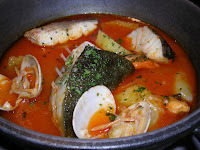 Salt may not be needed, as the mussel broth is fairly salty. Put the mussels in a pot with the bay leaves and water. Cover and place on a high heat. Shake the pot several times, until the mussel shells have opened. Remove from heat. Drain them, saving the liquid. When mussels are cool enough to handle, remove mussels from shells and discard shells. Heat the oil in a cazuela or skillet and sauté the onion, pepper, garlic and sausage, if using, until onion is softened. Add the potatoes, wine, pimentón, thyme and pepper. Strain the mussel broth through a fine sieve and add 1 cup of it to the potatoes. Cook until potatoes are tender, about 20 minutes. Add the mussels and reheat. Let rest 5 minutes. Serve sprinkled with chopped parsley. By 8 pm, early for Madrid, I was ravenous. 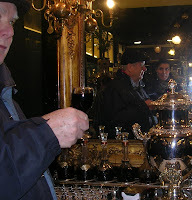 Three of us ducked into a neighborhood bar near where I was staying with friends in the Ventas district of Madrid. Glasses of red wine were set before us and, without asking, a plate of lacón, sliced cured and cooked pork, sort of like picnic ham, drizzled with a little olive oil and pimentón (paprika). Though I never saw the name of the bar, my guess it was El Gallego—the guy from Galicia—because lacón is such a signature dish of that northwest region. The evening’s tapa-hopping would take us on a virtual tour of Spain’s regions, with a stop in a La Rioja wine bar and on to a standard-bearer for Andalusia. 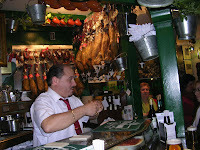 Billing itself as an Andalusian taberna, El Rincón de Jaén (with five different bar-restaurants in Madrid) specializes in shellfish and ibérico ham. Within minutes of ordering red wines, a plate heaped with fritura mixta, mixed fish fry, with rings of calamari, small, fresh anchovies and a few shrimp was set before us. Piping hot, it was as delicious as anything I’ve eaten back home in Andalusia! We ordered another round of wine and asked for a plate of mollejas. These are sweetbreads, a delicacy of traditional tabernas. Fried crisp on the outside, they were creamy morsels within. The plate came with lettuce, tomato and fried green peppers. 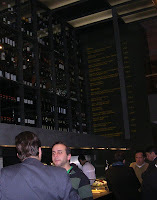 The total bill was €27 (about $37.00) for six glasses of wine, “free” plate of fried fish and plate of sweetbreads. El Rincón de Jaén is at Don Ramón de la Cruz 88; Madrid. Trendy, modern decor sets Sula apart from tipico tabernas, but, surprisingly, the tapas barely wink at the avant-garde. The soldaditos de Pavía, puffy, batter-fried salt cod, crisscrossed with strips of red pimiento, were classic renditions of this Sevilla bar tapa. We didn’t order the house specialty, exquisite ibérico ham (truth be told, we were getting lashings of it at the tasting stands of Madrid Fusión gastronomy conference). Instead, we sampled two cuts of fresh ibérico pork, secreto and solomillo, each grilled and served atop bread. The secreto was, frankly, chewy; the solomillo, or tenderloin, was melt-in-the-mouth tender. These we chose as part of a six-plate deal for €13.65 (about $18.60) that also included, asparagus tempura and mini chicken burgers with caramelized onion relish (yum) and pisto (similar to ratatouille; see the recipe below) with fried quail’s egg. I ate the quail’s egg in one bite, but the other tapas we shared. With a lovely Garnacha wine, our tapas supper was much enjoyed. Sula flips the “cellar” concept on its head—racks holding 4000 bottles of wine aren’t cellared, but soar to ceiling height (the restaurant is on the upper level). Sula is at Calle Jorge Juan 33, Madrid. On Day 4, we were off to a tapas event at the Mercado San Miguel, a market right next to Madrid’s grand Plaza Mayor, where stalls proffer meat, fish, fresh produce, bread, pasta, oysters, wine and tapas. On the way there, we stopped off at Lhardy, a Madrid institution. Not actually a tapas bar, it’s a delicatessen and high-class take-away food shop (restaurant above), where a restorative cup of consommé or dainty ham sandwich can be had. We had a glass of red wine with puff pastries filled with chorizo. Lhardy, Carrera de San Jerónimo 8, Madrid. Right on the Plaza Mayor is Casa María, where you can get a tapa or snack from 9 am right through until 2 am, every day of the year. We nibbled ham croquettes and watched waiters carrying bubbling fish stews to diners in the restaurant. Casa María, Plaza Mayor 23, Madrid. On my last night in Madrid, I declared, “No more tapas.” (Lunches at the gastronomy fair were grazed, on foot, at stands proferring everything from Asturian cheeses, ibérico ham, Castilian garlic soup, Andalusian olive oil, to canapés of sea urchin roe.) I wanted to sit at a table, eat salad, eat a meal with knife and fork. I offered to cook—but first, I had to make a trip to the funky, local market a block away (open late into the evening) to pick up salad greens and a few other groceries. And, wouldn’t you know? Across from the fruit and vegetable stand was a little bar. We joined the locals for a slice of tortilla de patatas, potato tortilla, and a glass of red wine. My last tapa hop—until the next trip. This is a splendid vegetable dish, that can be served hot or cold. Topped with a fried egg, it’s a great supper dish. For tapas, serve small portions of the vegetables topped with fried quail’s eggs. Place the cubed eggplant in a colander and sprinkle it liberally with salt. Let it drain for 1 hour. In a pan, heat the oil and sauté the onion and eggplant for 5 minutes. Add the garlic and green pepper and sauté another minute, then add the tomatoes and zucchini. Sauté on a medium heat another 5 minutes. Season with salt, oregano, pimentón and pepper. Cover and cook on a slow heat until vegetables are soft, about 20 minutes, stirring frequently so vegetables don’t scorch. The mixture should be juicy, but not soupy. Serve hot or cold, garnished with chopped parsley. If serving cold, add a touch of vinegar.